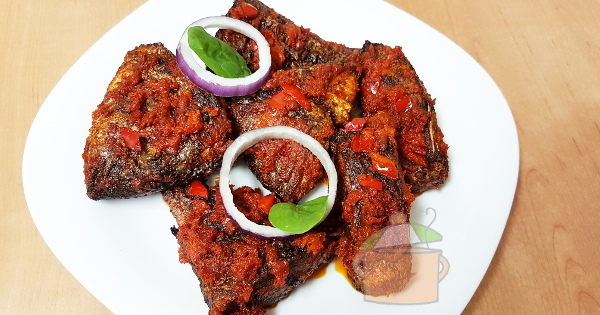 Peppered Fish is that special something you can serve your guests when they visit you at home. You don't have to wait to get to the next Nigerian party to enjoy this. You can use tilapia, red sea bream fish, gilthead fish or catfish. Never use mackerel for peppered fish. Mba o! The following are the ingredients I used in the video below. You can also use Red Sea Bream Fish, Tilapia, Catfish and other similar fish. When using catfish you need to first of all pour hot water on it to remove the slimy substance. Click here to see how it is done. Sweet peppers are not spicy at all but Nigerian tatashe is spicy so bear this in mind when using tatashe because you will not need to add as many habanero peppers as you would when using sweet peppers. Habanero as well as Scotch Bonnet peppers are atarodo, atarugu or ose oyibo. I like the taste of sweet orange in fish, you can skip it if you don't want it. You will need about 3 tablespoons of vegetable oil to fry the pepper puree, the rest for deepfrying the fish. Remove the scale of the fish. If using catfish pour hot water on it for a short time to remove the slimy substance. Remove the intestines without cutting the sides of the fish. Fish monger can expertly do this by removing the intestines from the gill pockets. Rinse the fish very well, cut into desired pieces and put in a bowl. Grind the oregano, black pepper, thyme, cumin, salt and onion powder with a dry mill. Add the herbs to the fish, crush in the stock cube and squeeze the orange into the bowl. Mix well, cover and put in the fridge to marinate for at least one hour. If you do not have a fridge, place in a cool place for one hour. Meanwhile chop half of the onions and the peppers. Blend partially with an immersion blender, no need to add water. With a normal blender 3 pulses are enough and you may need to add water depending on how your blender works. Lets make the Peppered Fish! Pour the pepper blend into a pot and start cooking. The plan is to cook it till all the water dries up. After one hour of being in the fridge, bring out the fish. Remove the fish and pour any liquid in the bowl into the boiling pepper. When the water in the pepper has dried up, pour 3 tables spoons of vegetable oil and fry for about 3 minutes, stirring it all the time. Set aside. Deep-fry the fish till brown making sure that the inside is well cooked. Add the fish to the fried pepper and mix very well till every single part of the fish is coated with the pepper. The fish is ready to be served on its own with a chilled drink, with Jollof Rice or Abacha. Yum!